This polar coordinates calculator is a handy tool that allows you to convert Cartesian to polar coordinates, as well as the other way around. It is useful only in a 2D space - for 3D coordinates, you might want to head to our cylindrical coordinates calculator. This article will provide you with a short explanation of both types of coordinates and formulas for quick conversion. As you probably know, coordinates are used to uniquely describe the position of a point in space. For know, we will limit ourselves to a 2D space. It means that we only have two dimensions: height and width (no depth), just as on a piece of paper. The Cartesian coordinate system is created by drawing two lines perpendicular to each other. Then, the point where they meet is called the origin of the coordinate system. Coordinates of any arbitrary point in space are the distances between this point and the two lines, denoted the x-axis and the y-axis. The polar coordinate system, on the other hand, does not include any perpendicular lines. The origin of the polar system is a point, called the pole. An arbitrary ray from this point is chosen to be the polar axis. To find the polar coordinates of a given point, you first have to draw a line joining it with the pole. Then, the point's coordinates are the length of this line r and the angle θ it makes with the polar axis. 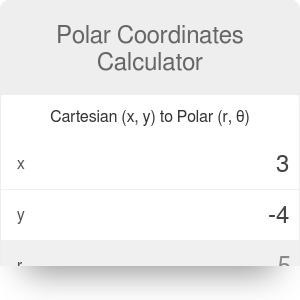 Our polar coordinates calculator is able to convert between Cartesian and polar coordinates. (r, θ) are the polar coordinates. 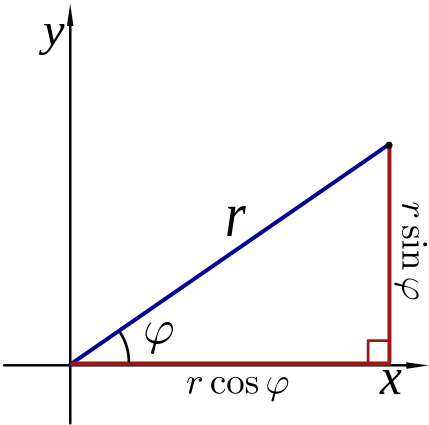 θ has to lie within the range (−π, π]. You can notice that the value y/x is the slope of the line joining the pole and the arbitrary point. Polar Coordinates Calculator can be embedded on your website to enrich the content you wrote and make it easier for your visitors to understand your message.